Over the past month several media communications senior overview projects have been on display in Thailand to offer a glimpse into expression and experience of students studying at the Webster campus in Cha-Am. The 5th annual December Toast: A Celebration of Our Mid-Year Graduates was held Friday, Dec. 16, in the Community Music School Concert Hall. President Beth Stroble, Provost Julian Schuster and the deans from each of the schools offered congratulations and remarks to the graduates. 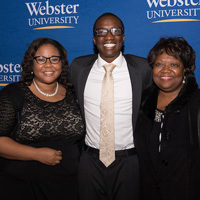 Charlie Hahn, vice president of Advancement, welcomed the newest alumni to the Alumni Association, which was founded by a small group of Webster graduates in 1923 to maintain a connection between Webster alumni and their alma mater. For the eighth year in a row, Webster University music students and faculty gave St. Louis a performance to remember with the “Gift to the City” holiday concert at Christ Church Cathedral downtown. This time, and for the second event this year, one student even took a turn to conduct his own work. Myra Nelson, a senior studying Advertising and Marketing Communications at Webster was one of three students to win the American Advertising Federation's Ad Club Scholarship for 2016. Myra and her professor Kristen DiFate were recognized last week at the Ad Club 2016 Reunion Dinner at Kingside Diner.